The Tektronix Type 1A1 plug-in for the 500-series scopes has two channels and a -3 dB point of 50 MHz at 50 mV/Div, 28 MHz at 5 mV/Div, and 2 Hz to 15 MHz at 500 μV/Div when channels 1 and 2 are cascaded. There were three distinct versions of 1A1. 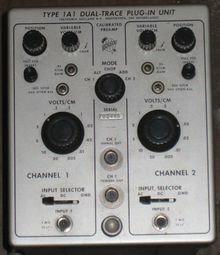 The first version, from 1964 to 1966, has a Nuvistor front-end, and rotary input switches that were concentric with the BNC jacks. The knobs to invert the input channels are concentric with the vertical position knobs. The second version, from 1966 to ??? has fluted round V/cm knobs, and lever switches. The channel inversion control is an organ-style pull-push knob. The third model, from ??? until the end has four-sided V/cm knobs and a FET front-end. Type 1A1 uses the "ALT SWEEP SLAVE PULSE" signal that is sent by scopes on pin 7 of the plug-in connector. In a Type 547 mainframe, this signal allows channel 1 to be displayed using the "A" timebase and channel 2 using the "B" timebase. This is useful, for example, to view the IF and AF of a radio receiver at the same time. Even after the front-end transitioned from Nuvistors to FETs, the output amplifier continued to use Nuvistors. Type 1A1 has an External Trigger output for mainframes prior to the 547 that don't support plug-in triggering. Types 1A1 and 1A2 were introduced together in 1964, the former for high-end use, the latter as an upgrade/replacement for Type CA. Both remained available until the 500-series scope line was discontinued. The 1A1 is not a perfect superset of the 1A2; it supplies external trigger from channel 1 only. The 1A1 may have evolved from the Type J, which never went into production. 556 with second version 1A1 in left bay and first version 1A1 in right bay. Latest version 1A1. Photo courtesy of Dan Wilson (Hideaway Studio).